Ryan Packard, ESS Marketing Director: Could you talk about your experiences and influences with plant life and architecture? What inspired you to work with the space and vegetation? Stephan Moore, Sound Artist: Interesting question! For the past several years I have been working with an organization on the East Coast called the Caramoor Center for Music and the Arts. There, I have been curating exhibitions of sound art that integrate in various ways with the gardens and architecture, and speak to the history of the site, the flora and fauna that live there, and the human use of the site. It’s proven to be a rich education for me in the ways that sound can take on meaning within an outdoor space, and I draw inspiration from conversations with the many artists I have watched approach these projects. The inspiration to do this specific work came from ESS’s invitation to participate in the Florasonic series. 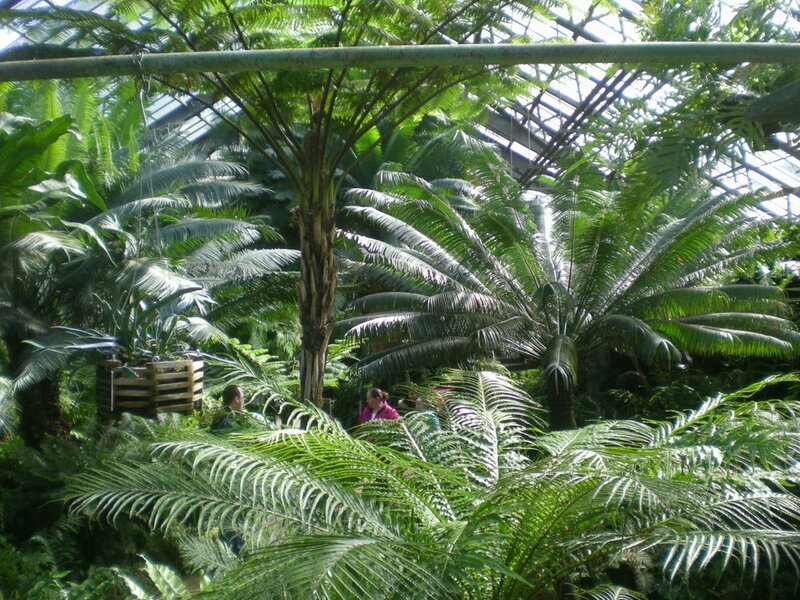 When I was asked, I immediately went to the Lincoln Park Conservatory and became enchanted with the Fern Room — the warm interior climate, the scent, the angled, translucent roof, the strange acoustics — it immediately struck me as a very unusual and special space. Lincoln Park Conservatory is clearly a cultural treasure of Chicago, and as I am slowly adopting Chicago as my home city (I only arrived 2.5 years ago), it’s a privilege to work there, to connect with the city in this way. RP: While making this work, you used the Wall of Metals, an instrument of your creation that has a complex harmonic palette. Could you describe the instrument, how you play it, and how it works within the context of the piece? SM: It’s not completely true that the Wall of Metals is my own creation. It was heavily inspired by the Steel Cello, which is an instrument invented by the musician Peter Warren (check out his classic album Bowed Metal Music). Several years ago, I was introduced to the Steel Cello by his niece, Sarah Warren, while we were living in Troy, New York. That instrument was huge, with plenty of room for two people to play it at the same time, and Sarah and I played a number of duo concerts with it. This past year, as I was preparing to score the dance work Stage by choreographer Yanira Castro in NYC, I found myself thinking a lot about the sound palate of this instrument — expressive, rich with harmonics, with a range from low to high, soft to loud, and pure tones to total noise. Also, it’s appealingly unpredictable to play, forcing you to listen carefully and respond quickly to changing situations — there’s no way to play it without improvising, as it improvises with you. I was already designing instruments that were a fusion of box fans and cymbals, so the extension of the sound into this metallic world became more and more central to my thinking until I finally reached out to Sarah and asked whether she would let me borrow, rent, or buy the instrument from her. Her response was perfect, she said “No, but I will give you all the information you need to build your own." I collected the pieces that Sarah suggested and added a number of touches of my own along the way, departing from Sarah’s model in a few key ways, but retaining the same basic idea. When I had gathered the materials and planned out the construction, I brought all of it to my old friend Noah Modie at Oxbow Design Build in Easthampton, MA. Noah, in addition to having a great machine shop, has the fabrication skills that I lack and was able to correct a few major flaws in my design. Working together we were able to complete the instrument over this past summer, in time for rehearsals and performances of Stage. Since September, the instrument has been sitting in my storage space and I have been itching to get it out and continue working with it. Thanks to this project, I was able to set up the Wall of Metals for a week in the ESS recording studio and work with engineer Alex Inglizian to make a number of recordings, including some beautiful playing by Chicago musicians Hanna Brock and KG Price. RP: I'm always quite interested in how sound artists/composers start formulating their work. Can you describe the beginning stages of the piece and how it developed and changed over time? SM: I usually start with something that tickles me, which could be an observation about the space or a particular vocabulary of sounds, and then allow the piece to teach me about what it wants to be as I make it. It’s been a somewhat compressed production schedule, but the pivotal moment came when I was editing the sounds I recorded at ESS and hearing the great detail we were able to capture. I became most interested in finding ways to allow these sounds to interact with the space and balance with the room’s other sounds — crickets, trickling water, the voices of guests, footsteps, and the air handling system — so that the details would be available to listeners as the sound rises and falls. I am grateful that ESS granted my wish to add a subwoofer to the space’s sound system. It allows the warmth of these sounds to saturate the room, which is important to the character of the piece. RP: You beautifully described the project as a response to the harmonies and dissonances that hover in the balance between the room's architecture and its fragile, organic contents. How does the music in form, timbre, and material reflect this delicate balance? SM: The Wall of Metals produces sounds that are at once organic and mechanical — sometimes noisy, but also sometimes pure to the point of almost sounding digital. Often its voice is rich with multiple inharmonic frequencies. By slowing these sounds down, we get to hear the tonal choreography or “spectral drama” of each sound as it unfolds. The structure of the piece is, itself, a constantly unfolding composition that is described in software, but which I cannot predict. This kind of music-making I liken to gardening — there’s only so much control you can exert over the structure, and you try to set it up to succeed, but after that it’s all about a mutually influential relationship between the sound materials and their environment. So, hopefully, the balance I described is present not only in the timbre of the sounds, but in the generative process that structures those sounds across time.